Join Huntsville’s #GivingHoliday celebration of paying it forward! Featuring fun sing-alongs, sumptuous pot luck foods, and lots of love from the local community! Giving Tuesday, often stylized as #GivingTuesday for purposes of hashtag activism, refers to the Tuesday after U.S. Thanksgiving in the United States. Giving Tuesday was started by the UN Foundation and NYC’s 92nd Street with the goal of encouraging global charitable giving on social media. Falling on November 27 this year, Giving Tuesday has gained global popularity since its 2012 launch, with online giving on #GivingTuesday 2017 increasing by 28% over 2016. * This year, Urban Engine and its affiliated partners are participating in a global movement to create an international day of giving at the beginning of the Christmas and holiday season for the city of Huntsville and beyond. Urban Engine is known as Huntsville’s most dynamic non-profit ideation accelerator. 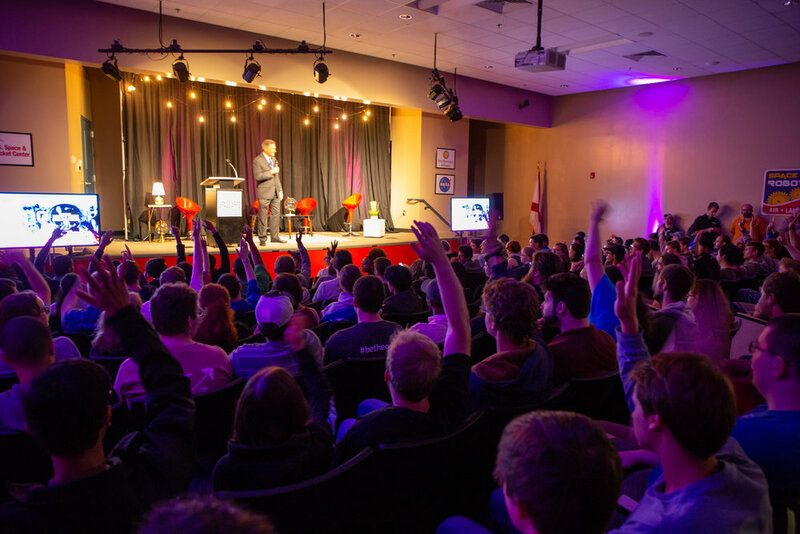 Our organization is dedicated to the livelihood of Alabama’s startup and innovation communities, where all individuals are welcome to learn, connect, and collaborate. Our purpose is to propel the growth of Alabama’s economy by connecting aspiring entrepreneurs and established business leadership with educational resources, talent, and community. With your support during this #GivingHoliday season, our communities of startup entrepreneurs, young creative professionals, and aspiring business leaders can feel supported in their efforts to raise the economic development initiatives of Alabama. Propelling ideas forward happens before, during, and after each successful CoWorking Night™ that is provided for FREE in Huntsville and Birmingham every business week. Show your steadfast commitment to the Urban Engine mission by sponsoring this message. If you believe your startup community can build momentum, more jobs can become available, and your professional skill sets can benefit from a little more interaction & collaboration in your community? This is your chance to make a real difference! Every week, we have dozens of volunteers giving over 100 hours in earnest to make CoWorking Nights™ a successful community program for young professionals & seasoned business leadership across Alabama. Do some good in their world & buy them some holiday dinner to feast upon. (Y)our people are passionate ♡ Give any amount with a note of thanks! GIVE: BACK TO THOSE ON THE ROAD! All ideas are worth hearing, but only those who give true value can sustain our communities. Urban Engine supports the rapid-paced startup ecosystems in Huntsville and beyond, whether they are local to Huntsville or traveling abroad. Help us support local business development across the Alabama region by donating today - with your help, we can scale our mission around the globe! GIVE: TO Keep the Lights on. Our small non-profit organization has expenses of more than $10,000 per month to support the CoWorking Night community in Alabama. With supporters and believers just like you, EVERY single dollar you contribute supports the mission & helps keep our office lights on. - While we are dedicated to propelling ideas forward across the nation, our community mission starts at home. We understand the Alabama ecosystem requires passion, commitment, sweat equity, and most of all — results. With your generous contribution and sharing this message by word of mouth, we believe in a better workforce environment for all upcoming generations.